Foliage: Alternate leaf arrangement; leaves elliptical to lanceolate with an acute apex, 1.5 to 4" long, and 3/4" to 1-1/4" wide. Leaf margins very finely serrated (toothed); medium to dark green leaf color, and leaf surface is glabrous (smooth, without hairs). Mahogany to orange red fall foliage. Deciduous to semi-evergreen. Stems are purple red on the sun-exposed side and green on the opposite side. Twigs have green, chambered pith; 3 bundle-scars (monkey- face). Flowering time: Flowers early June to late June; fruits about September, persisting over the winter. Habitat: Pine barrens swamps, streambanks and other moist habitats. Range in New Jersey: Frequent in Pine Barrens swamps and locally in West Jersey and the Cape May peninsula. 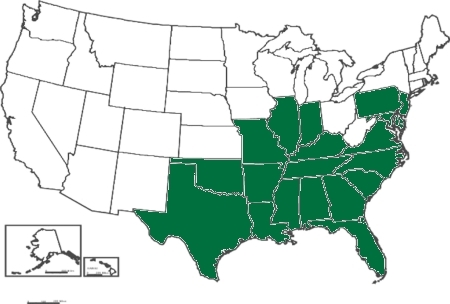 Itea virginica is at its northern most range in New Jersey. Misc. USDA lists as an obligate wetland plant; occurs almost always (estimated probability 99%) under natural conditions in wetlands. 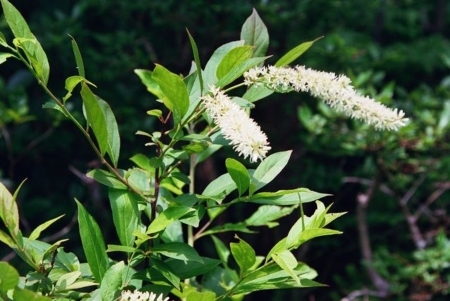 May be confused with Clethra alnifolia (Sweet pepperbush). Used in landscaping; flowers attracts butterflies; seeds eaten by birds. Several cultivars exist. 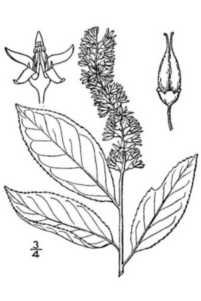 Itea, Greek for willow, and virginica, of Virginia.